We talk a lot about putting soul in our new machines. The phrase comes from a book by Tracy Kidder. Ira Flatow of NPR's Science Friday recently took a new look at this book. There are TWO recordings in this link. Both are worth listening to. The second is an interview with the author, conducted at Google HQ in New York City. Woz chimes in. At about 6:43 in the second interview, Ira Flatow and Tracy Kidder get into a little argument about how to pronounce the word "kludge." I'm with Ira -- the fact that he pronounces it this way makes me think that we are using a New York, or at least and East Coast pronunciation. I am a big fan of Tracy Kidder. His "Mountains Beyond Mountains" is about Dr. Paul Farmer, a heroic physician who has dedicated his life to treating the poor people of Haiti. "My Detachment" is about Kidder's stint as an army officer in Vietnam. Kidder and his editor wrote a nice book about the crafts of writing and editing: "Good Prose." "Strength in What Remains" is about the genocide in Burundi. Scroll down to kit #25 for more details on the device pictured above. This is really great. I want to build one. I have to build one. I NEED one of these. Great work Farhan. Thanks for bringing the ham community another amazing piece of gear. 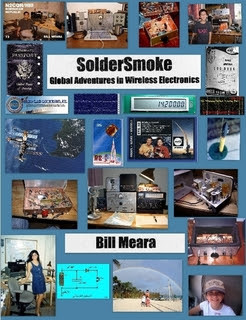 On the occasion of the tenth anniversary of the SolderSmoke podcast, I have reduced the price of the book "SolderSmoke -- Global Adventures in Wireless Electronics." I've taken the price as low as Amazon and Lulu will allow. Unfazed! Fight HISS-teria! Give the Si5351 a Chance. 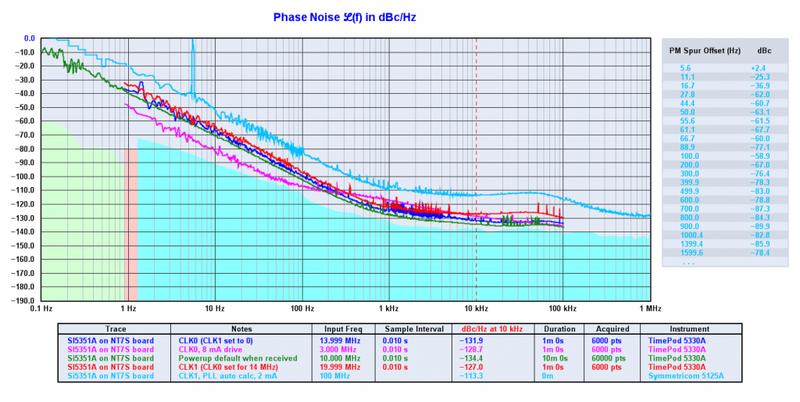 Thanks to all who have contributed to our discussion of phase noise and the Si5351 chip. Let me throw out some ideas -- some technical, others philosophical. 1) We may be worrying about this too much. In all of the homebrew or kit rigs we've built over the years, I never recall much concern about the phase noise specs of the LC or crystal oscillator circuit that we were using. What were the phase noise stats on a Heath VF-1? How about the phase noise stats for the little Hartley oscillator in those DC receivers we made? No one even checked. Our rigs usually worked just fine. We would have noticed if they were extremely noisy, but if they were good enough, we left well enough alone. It doesn't really make much sense for us to now be suddenly very concerned about the phase noise stats of the various DDS and PLL chips that are replacing those LC and crystal circuits, especially when the measurements show that they are usually in the same range as our old familiar oscillators. 2) The perfect can be the enemy of the good, and the "good enough." 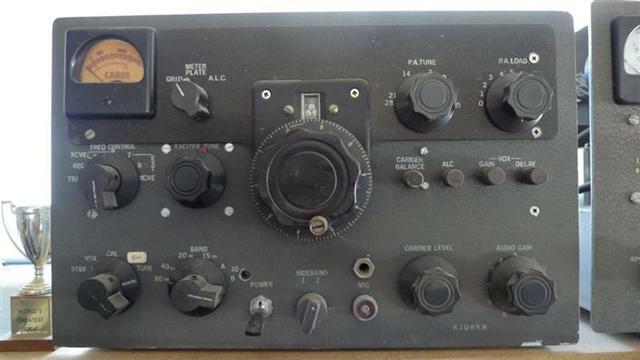 We have a long tradition in ham radio of tolerating less-than-perfect or less-than-optimum parts. Remember, the NE-602 has some shortcomings, but we use it. We use it a lot. The IRF-510 wasn't even designed to be an RF amplifiers, but we have pressed it into service for our PAs. 3) We should be willing to give a new part a try, and we should be pleased if it proves useful. We should be wary of untested claims re the unsuitability of a component. We have to avoid the "works in practice, but not in theory" situation. If something works well, doesn't create additional QRM, is inexpensive, and fosters experimentation and homebrewing, we should be happy about being able to use it. 5) It seems that whenever a new technology or part comes along there will be those who issue dire warnings about how we can't or shouldn't use it. When transistors came along, there were those who said that hams shouldn't homebrew with them because -- it was argued -- without spectrum analyzers we couldn't possibly come up with spectrally pure signals. 6) We have to be careful lest this obsession with perfection and extremely high tech standards be used as a rationale for not homebrewing, or (much worse) as an argument against homebrew rigs on the ham bands. There is a bit of this going around. Get on 40 meters with rig that drifts a bit or that is not "on frequency" to within 10 Hz and you will find out what I mean. 7) The Si5351 is a good part for our purposes. It does something new and VERY useful for us: It can put out BOTH our VFO and BFO frequencies. It makes it much easier for us to change bands and-or switch between USB and LSB. Its phase noise figures are fine. 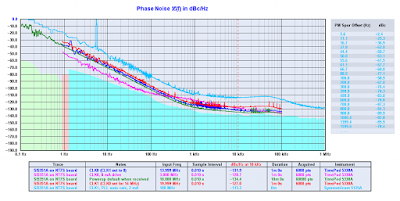 LA3PNA (citing measurements by KE5FX) notes: "The phase noise of the Si5351 is around -130dBc/Hz at 10KHz. This is quite decent, If compared to a Hartley or Collpits you would see little or no difference. Some of my measurements of published free running oscilators show phase noise in the -110dBc/Hz range!" We should give this little chip a chance! Give it a try! -- A trip down SolderSmoke memory lane. -- The SolderSmoke lexicon -- words and phrases we use (a lot). 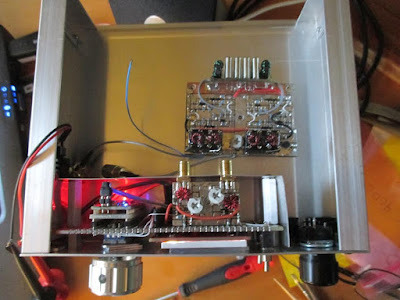 -- Bill's big amplifier problem fixed thanks to Allison KB1GMX. -- Six digit freq readout with an Altoids case. 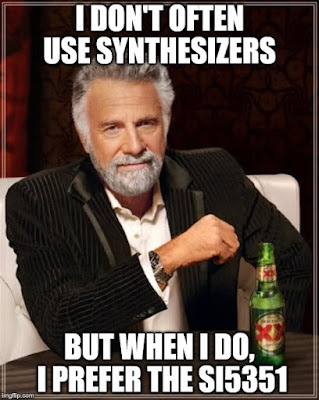 -- ALL oscillators make noise. -- Keeping things in perspective: It is 100 db down! -- Try it, you'll like it! The benefits trying things on real rigs. Interviews on "QSO TODAY" with Eric 4Z1UG. Looking at Saturn with telescope. Another recruit for the CBLA: Paul KA5WPL. Ron G4GXO on Bell-Thorn and Eden9 SSB rigs. Rupert G6HVY on Kon Tiki radio and Mr. Spock. Bryan KV4ZS will build an LBS receiver. Dave Anderson give Pete good antenna advice. Steve Smith moves in from the garage. 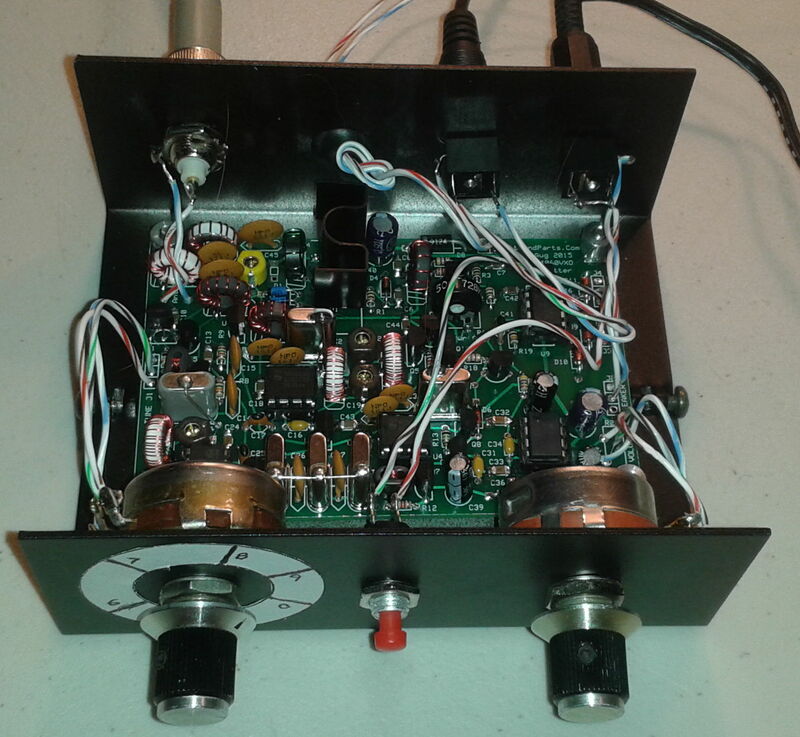 Pete has built 12 SSB transceivers. Intervention time? ARRL Handbook (2002) page 14.5: "You would be excused for thinking that phase noise is a recent discovery, but all oscillators have always produced it." I believe that the plots speak for themselves fairly well. If you compare these results to the receivers in the Sherwood Engineering receiver table, I think you'll see that the Si5351 acquits itself quite nicely for such an inexpensive part. Personally, I think the Si5351 is eminently usable for many receiver applications, except perhaps the most high-performance. Certainly for the price, it's going to be extremely hard to beat. I hope this motivates those sitting on the fence to decide if the Si5351 will meet their needs. 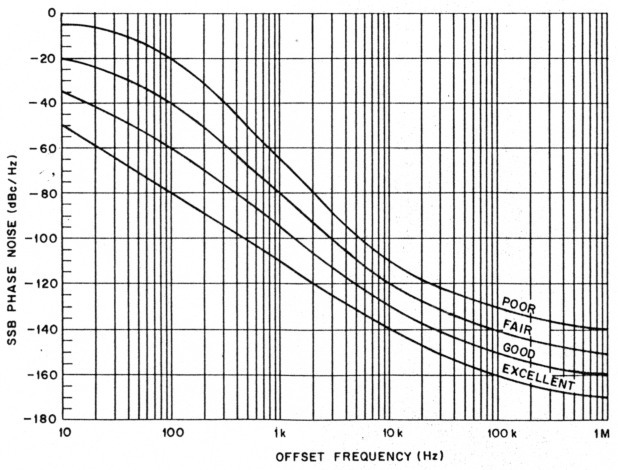 Be careful in evaluating statements saying that the Si5351 phase noise is 3-6 db worse than an Si570. This makes it sound like there is a LOT of noise coming out! But again, it is important to keep things in perspective: The noise from one chip might be -156 dbc/Hz while the "worse" chip might be -150 dbc/Hz. That's still not enough noise to make a lot of noise about. The ARRL handbook recommended a very simple check for excessive phase noise: Set up a very strong signal in the band of your receiver. Then slowly tune to the signal, listening carefully for any build-up in noise as you approach the signal. I did this, and I didn't hear any. As for transmit, well, as Pete points out, I think the spectrum police on 40 meters would let us know if our signals were broad or noisy! The ARRL Handbook notes that in a transmitter, "This radiated noise exists in the same proportion to the transmitter power as the phase noise is to the oscillator power..."
Man, I am loving the podcast! It is absolutely what I need, and what ham radio needs today!!! I am at about episode 168 trying to catch up. I would really like to build a Mighty Mite. I AM GOING TO BUILD THE MICHIGAN MIGHTY MITE. If you have any crystals left could you please send me one. I've got a 9 year old boy that's home schooled and I want to make this electronics hobby a stepping stone to a higher learning experience. I want a radio experience with soul! I think that maybe why folks still use CW. It's a mode with soul. 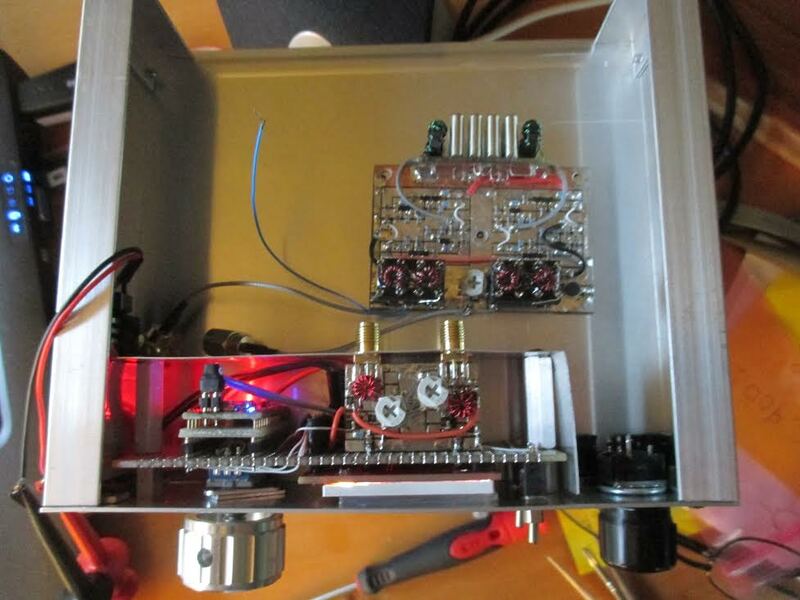 I know you champion SSB, but home brewing a CW transmitter and receiver has got to be a truly soulful experience. And its one I intend to have as one of my own. I too want to enjoy the "Joy of Oscillation ". With you guys inspiring me, I am sure this will be a wonderful adventure. For your guidance and inspiring work in the field of homebrew radio. The chemistry of you 2 guys on the show REALLY remind me of Click and Clack. You guys really work well together! 1) You MUST build the MMM and make it oscillate (thus experiencing the JoO). 2) You MUST send a picture or (better) a video of your MMM in operation. 3) You have to give me permission to put your e-mail (below) on the SS blog. 4) You have to send me your address so I can issue you a for-real SS 3.579 crystal (with mojo). I'll do my best to get video, at the very least I'll get pics. Also, being inspired as I am, I made a CW contact with 5 watts since I emailed you last. Thanks for helping me get the fun and excitement and the adventure back in to ham radio! Please send a card if you have one with the crystal. Thank you Brad Smith. Live long and prosper OM. 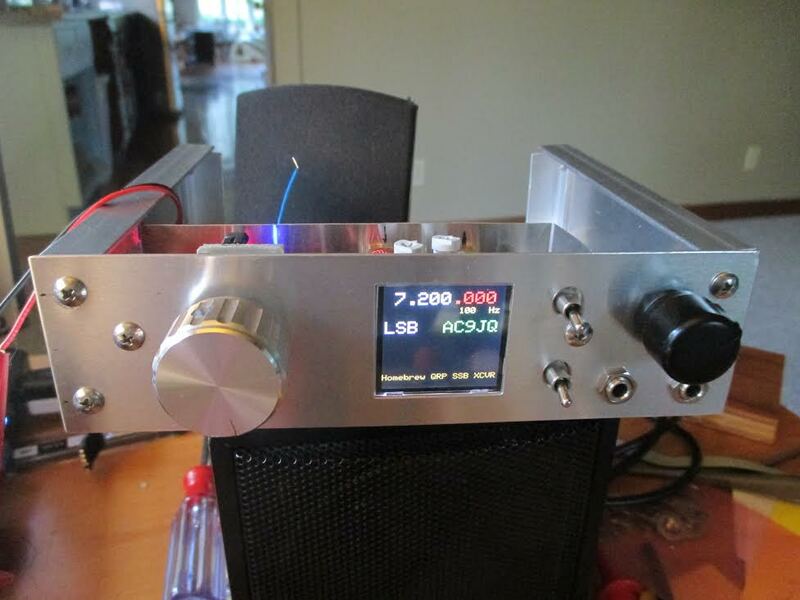 Shell, WA6KJN, has built some really cool homebrew rigs. And an airplane. On his QRZ page Shell writes: "I have saved all my old homebrew gear. This is a tube SSB exciter using a pair of 6146's in the final. It has a Collins mechanical filter. Built in the 70's. It had a matching receiver also with a mechanical filter in the I.F." Well, all I have on HF amp instability is anecdote and half-remembered theory. But I do like the sort of challenges that building RF on the bench brings up - a problem worthy of one's attention proves its worth by fighting back! London is indeed a hard place to play radio. But that makes it doubly pleasurable when it works: it rather feels like you're operating under cover, a special forces op sneaking the signal out under the noses of the regime. I once had a birthday picnic on Hampstead Heath where I brought my SOTA beam and fishing-pole mast: the local constabulary turned up and were also mystified but not quite so supportive... "What if everyone did it?" they asked. "Oh, if only..." I thought but did not say. I do hope you can pacify your errant amp. Sometimes these things can be fixed by brainpower, sometimes by just mucking around until they get bored before you do. But normally I find that I've learned a lot when the problem's solved. RF isn't black magic, it's a gateway into another world that's marvellous and enthralling, but ours to know. I read a really good paper by Freeman Dyson, where he said that Maxwell invented modern physics, because his equations were the first to show that the real world of how things work is both beyond our natural experience, but accessible through thought and logic. The real entrancing thing about radio is that it proves this - we can talk across the world by translating our knowledge into a tiny handful of otherwise inert bits and pieces that tap into something utterly beyond our senses. And it's open to anyone who cares enough to try. Anyway, thanks again for emailing - I'm thrilled to hear from you, and perhaps, who knows, one day we may make contact the way God and Maxwell intended - via QRP on a lively band while dodging the noise and bouncing our photons off the Heaviside Layers. 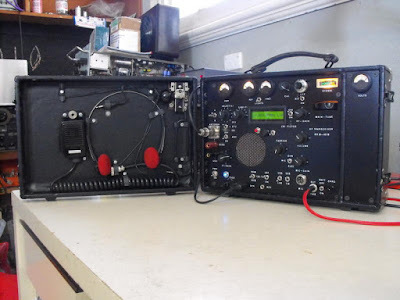 Other equipment here includes a Wireless Sets No 19 Mk III, an R1155, a Barlow Wadley XCR-30, an ICR-73, some PMR stuff on 4 metres, some old CB kit (shhhh!) and other obscurities. 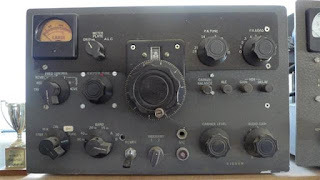 I like kit that has something different about it the 19 set, for example, is of course famous for its wartime role, but it was also the very first transceiver. 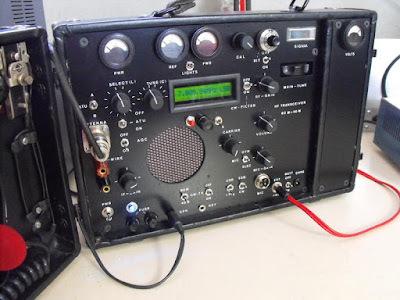 The XCR-30 is really interesting, not only for being a high tech product of 60s apartheid South Africa (so a morally complex thing to own), but for having a very esoteric design that provides 0-31MHz coverage without bandswitching, very high stability and accuracy (you can generally pre-tune an AM broadcast station anywhere on the bands from the dial and be within 1KHz on switch-on, and all from a handful of transistors. There are stories to tell about all of my radios. Started in radio when I was too young to get my ticket, so was forced - forced, I tell you - onto CB radio, in the days when it was very popular and very illegal. Had a couple of crystal-TX, super-regen RX walkie-talkies (QRPp and RX so wide I could pick up Radio South Africa on the BC 11m band) to start with, thence bought a 'for conversion to 10m' populated CB PCB from a batch at Plymouth ARC Rally and just bunged a set of toggle switches on the PLL-02 divider inputs. 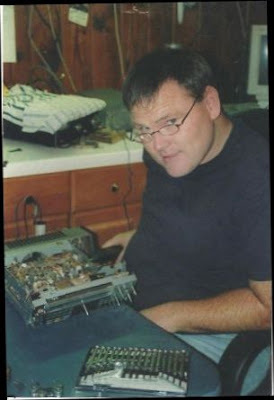 This was the mid-late70s, when skip was high... Did the RAE ASAP after my 16th birthday, first legal amateur rig (I may have built things with 6V6s that may have made odd noises on the local Top Band AM Sunday morning net) was an Icom IC-2E. My richer friend, who was a G6E, had an FT-290R, which was obv. nicer but obv. deafer. "FT-290. IC-2E. I can hear him. He can't hear me." Used 19 sets at school, so have that addiction too. Since then, the hobby has been in and out of my life (like QTHs, wives, jobs and money), but the love of radio never has. I also understand that he once worked at a dodgy TV repair shop in the back streets of Plymouth and can still swap out a gassy PL509 with the best of 'em. I have to keep reminding myself: This is not "plug and play." These are not appliances. After I got my 40 meter problems squared away, I was doing some testing on my beloved 17 meter BITX. I noticed something weird: With the CCI EB63A amp feeding my 17 meter Moxon antenna, as I raised the output of the BITX17 driver, at one point (at about half the max input power) the SWR would suddenly spike. Then, as I raised the drive level above that point, the SWR would go back to normal. I looked at it on the 'scope. I can see the signal go very ugly at the mid-level drive point. In the FFT display, I can see that there is a strong signal at around 435 kHz. The 18 MHz signal seems to be riding along on top of it. Take a look at the video above. I see no signs of the 435 kHz signal at the output of the BITX 17. It seems quite clean. This problem disappears if I replace the Moxon with a dummy load. This problem does not show up if I feed the EB63A with my almost identical BITX20. And I use the same LP filter on both 20 and 17 in the CCI amp. Any suggestions? Has anyone had this kind of problem? Allison and Pete have been helping me with this. Thanks to both of them. There are currently only 2 in the universe. And they have been talking to each other. Soon there will be more. Many more. I and Diz have been playing on 20m with 1W. atomic clock above the desk for logging purposes. the paddle to call him and he went back to AF5XF in NTX. We had a SolderSmoke "SETI at Home" team. Anybody know how are we doing? Pete is Having Antenna Project Problems -- Can you Help? Our friend Pete, N6QW, has run into some difficulties in his antenna project. The push-up/tilt-over mast he is working with doesn't seem to be up to the task. Just look at what this is doing to him! Does anyone out there have suggestions on how Pete might easily get his 2 element beam up to about 30 feet without spending kilo-bucks?